Since the U.S. is no longer a major apparel manufacturer but one of the largest apparel consumption markets in the world, we’ve seen an increase in the value of apparel imports. 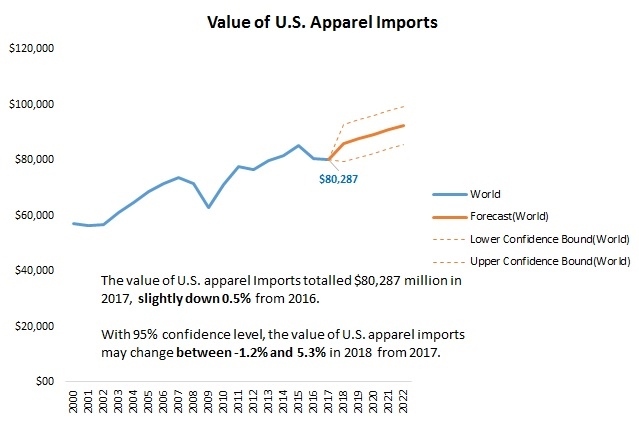 The value of U.S. apparel imports reached $80 billion in 2017, which is a 40% increase from 2000 according to a report from the University of Delaware. Over $40 billion worth of textiles and clothing came from China, followed by Vietnam ($12 billion), and India ($8 billion). In addition, we’ve also seen the rise of fast fashion like Zara and H&M contribute to the growth in apparel imports. Companies like these big apparel retailers provide both in-store and online access for customers with affordable and stylish fashion on limited runs to help drive demand, which encourages consumers to buy more items more quickly. A garment's journey from cotton to thread to clothing to store has it crossing the globe several times. For a detailed look at global nature of the apparel business, see Planet Money's T-Shirt Project as they follow the making of a t-shirt around the world. If you're trying to follow the apparel your company is importing from abroad, all you need is a container number to start tracking your shipment on Crux Systems.